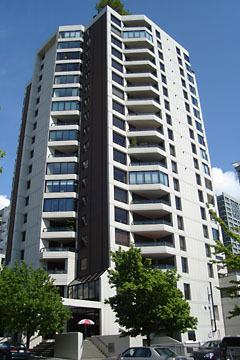 Harbour Heights is located in Belltown’s north end close to the Seattle Center. Constructed in 1980, it’s within walking distance to many restaurants, coffee houses, retail and nightlife, yet is located in a quiet part of Belltown. Units are a mix bag; some have been updated and rival newer condos, other are still in the 80’s. Nevertheless, Harbour Heights beats most of the competition in unit size and value. The units are spacious with fantastic views and price per square foot is among the lowest you’ll find in Belltown.